If updating your business’ Facebook or Twitter once a day is not on your daily to-do list then you could be missing a lot of opportunity to interact and gain valuable feedback from the people who matter most. Updating once a day might sound time consuming but thanks to the ever changing social media landscape there are tools to make this less painful. HootSuite is a great tool that allows you to update multiple social media profiles at once including the two most popular social media platforms Facebook and Twitter. This can cut the amount of time you spend on each website down to a minimum. HootSuite offers other useful tools to schedule updates ahead of time and provides you with in depth customizable reports that you can try and then purchase. 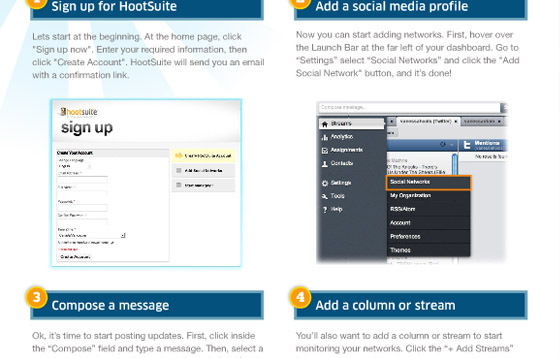 Visit HootSuite.com and sign up for a free account to begin setting up your dashboard. 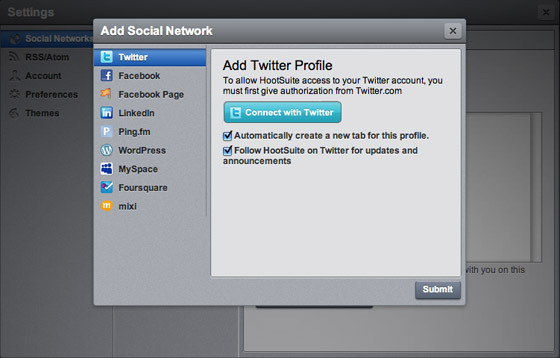 Hootsuite allows you to add a number of social networks in addition to Facebook Fanpages and Twitter profiles. Simply select the type of profile you want to add to your dashboard and follow the instructions. Once you have set up your account you can begin updating! Visit the text box at the top left of your dashboard and enter your update. On the right select the profiles you wish to update by click on them, a green check mark should appear over the profile’s icon. You can then add links, media, or schedule your update for a specific date and time! 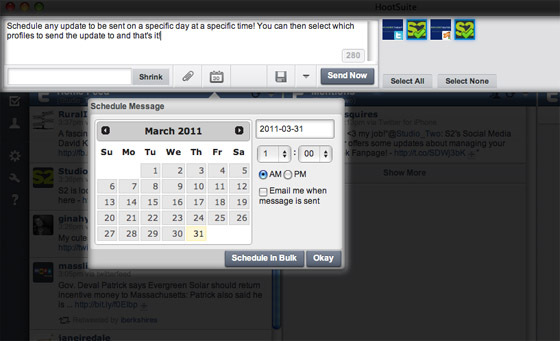 To schedule your updates click on the calendar and select when you would like the update to post. This is useful for making sure your update appears during peak hours even if you are not at your computer. Hootsuite also offers lots of helpful tutorials on adding a stream or column, composing a message, and what it means to reply, retweet, and direct message. The interface will become very easy to use after only a short time, click here to visit the HootSuite tutorials. Don’t forget to connect to Studio Two on Twitter and Facebook to stay on top of this ever changing world of social media! You can find us on Twitter @Studio_Two or on Facebook at Facebook.com/S2StudioTwo!